RONNIE Magsanoc and Benjie Paras are truly inseparable. 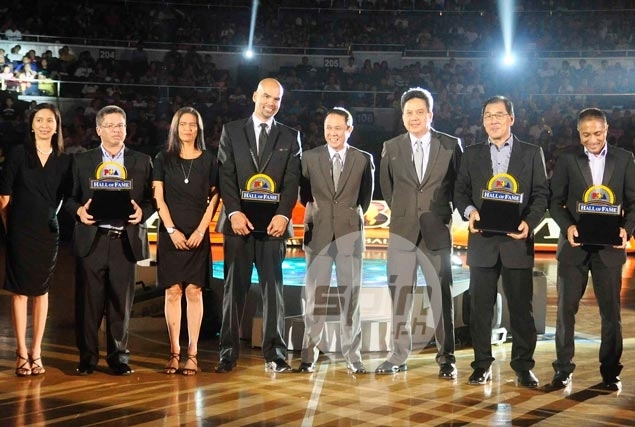 Now both retired, one of the most durable dynamic duos in Philippine basketball found themselves sharing the limelight together again as both were part of the 2013 PBA Hall of Fame which were honored during the opening ceremony of the league’s 39th season on Sunday at the Smart-Araneta Coliseum. The late Ed Ocampo and former top gunner Lim Eng Beng were also part of this year’s Hall of Fame class, but the biggest cheers and applause were for Paras and Magsanoc, whose latest achievement together further underscored a partnership that has withstood the test of times. Both of them are happy to be inducted in the`Hall’ alongside each other. ‘Very happy kasi magkasama kami sa lahat ng bagay, para na kaming magkapatid niyan e,” said Magsanoc in between his work as television panelist for TV5 covering the games together with Paras, the two-time league Most Valuable Player and the only Rookie-MVP in the long history of Asia’s first ever play-for-pay league. Paras, the man they called `Tower of Power’ reflected for a moment on how his partnership with Magsanoc, the so-called `Point Laureate’, has gone a long a way. Together they won championships with San Beda in high school, University of the Philippines in college, and with Formula Shell in the PBA where they formed the Mutt and Jeff tandem of the Turbochargers. “There’s a lot of memories that are coming back, nakikita ko `yung mukha ng mga teammates ko like sila Benjie, coach Eric (Altamirano), yung mga taong nakasama mo along the way, mga coaches mo, kaibigan. Malaking pasasalamat sa kanila dahil kahit sa pangarap hindi ko naisip ito,” said the 47-year-old Magsanoc, who played for 15 seasons in the league and at one time, was considered the best point guard in the PBA. Paras, 45, who also played for 15 seasons in the PBA, felt the same way. “Of course, very happy and proud. Ito `yung award na gustong makuha ng isang player. Kaya I would like to dedicate this to all the people na nadaanan at naging inspirasyon ko,” he said. Unlike Paras, who has two prominent boys playing the game, no one from the family appeared set to follow in Magsanoc’s footsteps as he has three lovely daughters. But no regrets there, according to him. “OK na yun. Ang mahalaga mahilig din naman sila sa basketball,” said Magsanoc. “At tsaka ninong din naman nila si Benjie."